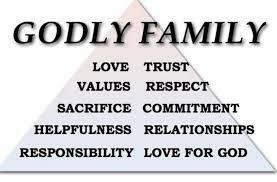 Family values are extremely significant in any family structure. The values that the family has adopted help in the establishment of a strong foundation in any given family. It also influences the decision making of any individual. It offers the appropriate guidance when raising the children. The instilled values help in protecting the family from the prevailing external influences. If a family does not have the correct values, the family experiences many problems when coping with the real situations in life. Although the causes of poor family values are complex, the most significant contributing factors influencing the family values are responsibility, honesty and integrity between the parents and the children. The main problem affecting the family values is lack of honesty, integrity, and absence of a sense of responsibility to self and others. Honesty is a key ingredient in the maintenance of peace and harmony is any family structure. Once an individual is honest, he/she chooses not to engage in activities that are like to compromise their virtues. It is inclusive of not lying, cheating or stealing. Once a person is honest, one develops a strong character that allows a person to be of service to other family members and to the rest of the community. Honesty is also an important factor in decision making for any given individual. The parents are responsible for cultivating this culture in their children. In order to teach the children the importance of honesty in a family, the parents must play a leading role in making sure that they are honest amongst themselves, as well as, with their children. A person from a family with good family values has a high likelihood of succeeding in life since they are trustworthy. These people are always at peace with themselves since others respect them. Dishonest people harm others, as well as, self. People who engage in dishonest activities damage their relationships with those around them. A honest person is not easily affected by the prevailing external influences since they are guided by the values instilled in them by their parents while growing up. Parent who trains children the importance of honesty in all that they do create a strong foundation for their families. Honesty and integrity go hand-in-hand. It is impossible to separate on factor from the rest. People with integrity possess strong principles in morals. A person who is morally upright are trustworthy and caring. They are also fair in their judgments, respectful, as well as, responsible to self and others. Trustworthy members of the family need minimal or no supervision in everything they do. In the case of any problem, they also seek guidance to the appropriate quarters. It is impossible for a person to install a virtue that he/she lacks to another person, as such; most children who grow up lacking in this important virtue adopt this from their parents. Psychologists state that, children are always a reflection of the parent (Struening 103). Children should grow with a sense of responsibility a trait that is normally borrowed from the parents. Responsible people will always show an added initiative in everything that they do. They always pay attention to even the smallest details. It implies that, responsible people are always ready to learn since they have a keen interest to learn. Therefore, this implies that such individuals are in a position to pursue excellence in their life. They are also loyal to their family members and the whole society. They keen interest on issues helps them in the improvement of their prevailing abilities through learning new skills, as well as, taking on broader responsibilities. Responsibility dictates that, the individuals are accountable when assigned with various duties. They end up fulfilling the expected commitments and have a high level of perseverance in having the job done (Oliver 97). It is evident that one’s family affects a person’s identity. Once a child is brought up in a dysfunctional family where the family values are not considered, there are high chances that the child will lack in this important features. In a family where the father is violent and abusive, the children might end up taking on this character. There is a high likelihood that, these children will practice the same in future since this is what they learned in their formative years. A child is like an open book; therefore, parents must always be extremely careful on what they expose to their children (Bekman and Aksu-Koç 67). The family values are imperative in terms of human development and behavior. The way one behaves or his/her outlook on various issues is highly dependent on one's upbringing. The foundation that was initially installed in a child is evidenced in his/her behavior. Positive or negative behavior is not normally because of the immediate environment but was acquired during the child's formative years (Muller 228). According to Muller, there are various factors coined in the family values that have either a positive or a negative effect on human development. The family, gender, and the immediate environment can affect the growth of human. He has also stated that one’s family has either positive or negative effect on one’s identity. The adoption of good family values such as the cultivation of honesty, integrity, and responsibility among children will obviously give them good human development and behavior. Therefore, poor family values may lead poor human development. Parents should understand that whatever they expose to their children, no matter their age, it would have either a positive or a negative effect in their future lives.